Prime Minister Justin Trudeau is defending Canada's diplomatic calling-out of Saudi Arabia's human rights record, saying he has "serious issues" about the case of Jamal Khashoggi, a dissident Saudi journalist now missing and feared dead. Multiple reports suggest Khashoggi, a Washington Post columnist who lived in the U.S., was murdered and dismembered inside the Saudi consulate in Istanbul. CNN reported today that Turkish authorities say they have audio and visual evidence showing he was killed just over a week ago, according to a Western intelligence agency familiar with the investigation. Trudeau said he shares the mounting anxiety over Khashoggi's fate. "This particular case is, of course, of concern, and we join with our allies around the world in expressing serious issues with these reports," he said today during a closing news conference at the Francophonie summit in Yerevan, Armenia. "Obviously there is a lot more to uncover on what happened here, so I'm not going to comment too much on this." Trudeau also pushed back against criticism of his government's handling of diplomatic relations with Saudi Arabia, responding to pointed words from Canada's former diplomat to Riyadh. In an interview with CBC's The National, Dennis Horak said he was not impressed with the tweet criticizing the kingdom's human rights record that effectively ended Canada's official ties with Saudi Arabia, calling it "a step too far." The post on Twitter from Global Affairs Canada — urging the immediate release of jailed women's rights activists — was translated by the Canadian embassy in Riyadh into Arabic. Within hours, Horak was expelled from his post in retaliation. He has since retired from diplomacy after 31 years. 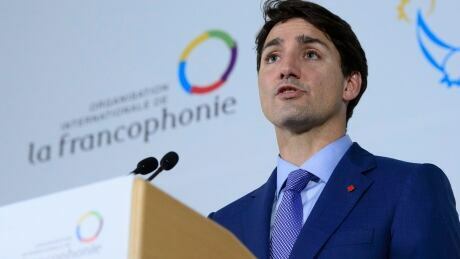 Trudeau said Canada will not back down when it comes to denouncing human rights abuses, suggesting the former ambassador should have known that Canada has been engaged in a significant diplomatic effort with Saudi Arabia for many years on various files. "We have been extremely active both in private and in public over many years now around our concern for human rights in Saudi Arabia. We will continue to be clear and strong in speaking up for human rights around the world," he said. "Regardless of with whom, we will always endeavour to do it in a constructive way." Asked if Canada would continue to sell arms to the kingdom in light of the Khashoggi case, Trudeau said the Liberal government inherited the agreement to sell light-armoured vehicles to the Saudis from the previous Conservative government. The Liberals respected the agreement but brought in measures to enhance transparency and accountability to ensure Canadians' expectations and Canadian laws are being followed, he argued.